This Good Son lands in UK bookstores with a reputation to live up to. This Seoul set Psycho-meets-Grey Gardens is soon to become a film. A hit at home and elsewhere in Europe, this latest tome is You’s first to get an English-language release. I don’t think the author realized that both Koreas would hitting the headlines just as the book lands on these shores; but the timing is striking. South Korean society, the strictures of familial bonds, the loneliness of urban life and the competitive rat-race all come under You’s authorial microscope. Add to that a creepy-crawly mother-son relationship and buckets and buckets of human blood and you have yourself a high-class nasty (in a good way) thriller. The pages of the first segment could’ve been printed on red paper so lethal and violent are the murders of onetime champion swimmer Yu-Jin’s mother and aunt. The heavily medicated 25-year-old is unsure if he created this bloodbath but cleans it up before the police can arrive anyway. As he scrubs and panics and panics and scrubs, we get flashbacks to the dysfunction and distress his family has suffered. 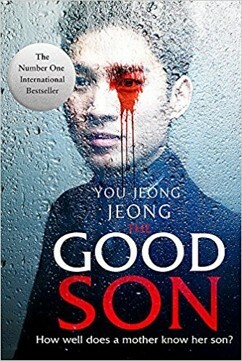 Yu-Jin’s father and brother drowned fourteen years earlier and his mother has taken in another young man Hae-Jin as pretend Son (of sorts). While the dead real brother Yu-min is not canonized, Yu-Jin was never allowed to forget he survived and must repeatedly swear fealty to the mother for having survived. Before her blood-soaked end, the mother never missed a chance to remind Yu-Jin of his luck. She makes the young man abandon competitive swimming (his great love) and she constantly reminded him his epilepsy-like medical condition is a disability. As the flashbacks weave their way through the novel, life today meanders forward. The cops come by, the adopted brother Hae-Jin reaches out, Yu-Jin scrambles to destroy evidence. Outside the flat, another murder takes place. You-Jeong Jeong masters the art of inserting facts like scarlet post-it notes throughout the narrative. For example, the exact detail of how and where the father and brother died come in two thirds into the story. But that mysterious sequence of events is always in the background illuminating Yu-Jin’s actions and shredding the reader’s nerves in the process. Divided over four long chapters plus an epilogue, the action takes place over just a few days. But it is a tense and terrifying period and the reader’s sympathies swing back and forth like a crazed pendulum. There are stumbles (in my view) along the road. Too much is revealed via the mother’s diaries, for one. The hallucinatory bits where Yu-Jin “hears” his very much dead mother’s voice were too numerous and confusing. Those quibbles aside, The Good Son is a remarkable work, tight, creepy, weird and downright scary in bits. For this reader at least, it shone a light on an unfamiliar society with institutions (schools and sporting events) and customs (around birthdays and gift-giving) that were new and interesting. You-Jeong Jeong deserves to acquire a new fan-base among English-language book readers. Her translator, also, delivers prose that is sharp, unemotional and chilling. High five to them both and enjoy the (blood-soaked) ride.